Fascinated with the "cacophony of humanity," he dedicated much of his life to observing society and how people relate to each other and the world around them. Ultimately this drove him to write full time. The Shan Takhu Legacy continues to gain steam with Fulcrum of Odysseus, the second book in the series penned by Eric Michael Craig. Jumping in immediately after the events in Legacy of Pandora, we pick up with Jeph Cochrane and the crew of the Jakob Waltz after their amazing discovery at L-4 Prime. Way out at the fringe of the solar system, they’ve found evidence for a very advanced extraterrestrial civilization. They are slowly working to master the aliens' language – a unique “test” developed by the aliens themselves – but events begin to spiral out of control as Katryna Roja – ex-chancellor of FleetCartel – speeds toward the Jakob Waltz with her small fleet. At the same time, the discovery of the Tacra Un has triggered events down system as an advanced artificially aware (AA) program called Odysseus consolidates power in the former Human Union through Derek Tomlinson, the former chancellor of DoCartel. Meanwhile, Edison Wentworth, ex-Investigator General of the Union (there are a lot of ex-folks in this book – which really speaks to the upheaval that Eric has made of their cozy little Union) is looking to find a hole to hide in as changes sweep the Union. But Edison finds himself entangled with Dr. Tana Drake, former chancellor of WellCartel, and her wife Saffia, as Tomlinson (through the prodding of Odysseus) hunts down Tana. Tensions quickly rise and war is not far off the horizon. I applaud Eric for another masterful performance. 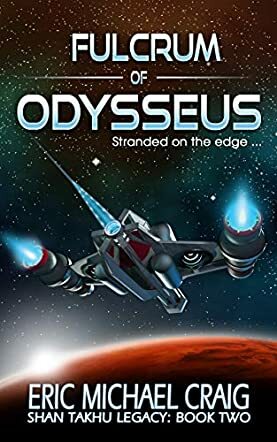 Fulcrum of Odysseus is a seat of your pants ride through a future rife with political intrigue, amazing discoveries, and real people doing their best to survive in a rapidly changing world (solar system?). Eric has changed things up a bit, making the events down system take the forefront of the action, while Captain Cochrane and his crew continue to deal with their discovery first hand. Jeph and crew realize that they are in a very dangerous position with the former head of FleetCartel barreling down on them, and the story line that focuses on the events around the Tacra Un takes on more of the political maneuvers and drama that were the focus of Chancellor Roja’s story in book one. I really love this change in the story lines for the different characters and I think it shows how situations change and develop for the characters. We also get to spend more time with Derek Tomlinson in this book and see how he reacts to becoming the dictator for the Human Union. Derek’s story line is very interesting. I don’t want to give away any spoilers, but I loved seeing him struggle under Odysseus’s orders. Derek becomes a man that you both loathe (I think hate is too strong a word for him) but you also pity because of the situation he is in. He is a fish out of water and struggles often because of this. I think he’s a great character because of all of this. I cannot recommend more than you pick up and read Fulcrum of Odysseus. Eric Michael Craig again delivers a very powerful and exciting story. I couldn’t put the book down and read the last several chapters in a marathon stint. (Of course, if you haven’t yet read Legacy of Pandora you need to go do that first) Great characters put into very exciting and rapidly evolving situations make this book stand out. It has all the hallmarks of a great sci-fi adventure and, really, I wonder why the television rights to this series haven’t yet been bought. Go pick up a copy today.